Our agile development processes helps our developers and designers accommodate the astounding ability of creating absolutely stunning websites for your business. WonderSoft Multimedia Solution’s WordPress development team has delivered 100+ projects with picturesque excellence. Since we entered the industry, we have gradually become the go-to company for custom WordPress website development due to the host of services we offer. WordPress is said to be the king of Content Management Systems. It is an innovative, easy and top-in-its class content management systems. Its intuitive structure and extensive options for themes gives a website a great look and feel with abundant functionalities. It’s a framework that provides a website with outstanding SEO visibility and speed. WonderSoft Multimedia Solutions (WMS) is a seeded name in the IT Solutions and Services industry in India as well as across the seas. We have worked on over 75 massive projects by developing stunning websites for our diversified clientele. The experience has enabled us to collect some of the gems which makes our company shine. 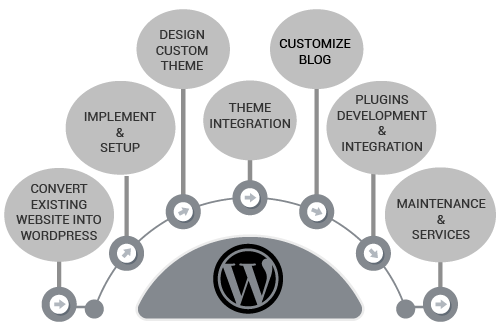 WMS offers exceptional WordPress Developers with astounding ability of creating absolutely stunning websites for your business. Hire talented WordPress Developers who can stuff your website with most efficient plug-ins for optimum functioning. WMS WordPress Developers deploy latest technology to yield powerful features for feature-rich themes in WordPress. Hire WordPress Development resources for designing websites which perfectly compliment your organisational goals.